It’s been almost 6 months since my last post here. I realize it’s a long time, but we’ve had a long, extremely cold winter that started off with a nasty ice storm just before Christmas, and another just after the new year, leaving a thick coat of slippery ice on everything much of the winter. As much as I love getting out to shoot the sky, I’m still recovering from a broken foot and ankle from last summer and wasn’t steady enough to venture out onto the ice. The few times I did get my gear out, it frosted over on me before I managed to actually get anything worthwhile. So there’s really been nothing worthwhile posting. 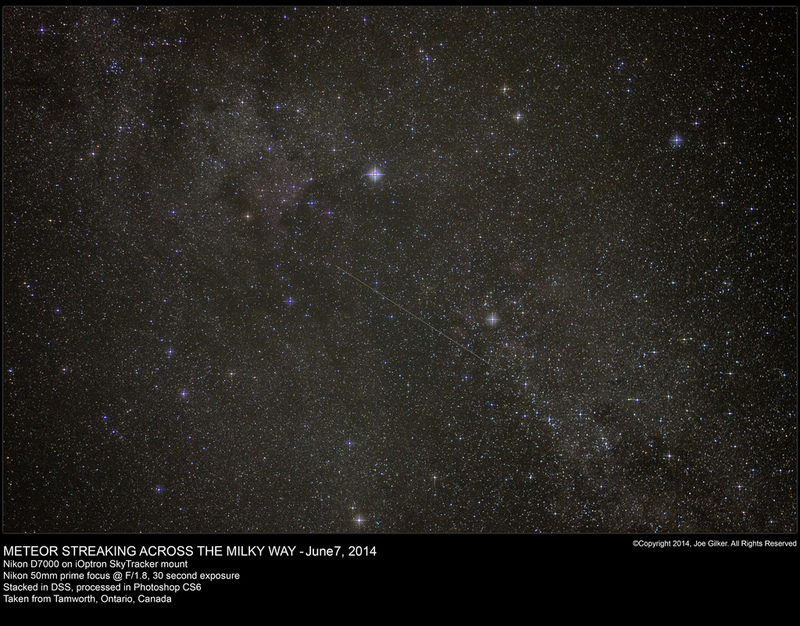 This spring, I started seriously looking at some wonderful images of rich star fields in the Milky Way. Some are so breathtaking with the sheer number of stars visible. I wanted to attempt taking such photos. Living in the city (albeit a small one), we never see the Milky Way without leaving the urban environment. Over the winter, I discovered we have the Lennox and Addington Dark Sky Viewing Area roughly 60 km away from my place. It’s said to be the most southern point in Ontario that’s free of light pollution. So this past weekend, I packed up my gear, grabbed a couple of friends, and headed out to try to get some good shots. Most of the evening, the moon was out. We took a few shots of it, but mostly we were doing visual observing until the moon set. We got some good visuals on different deep sky objects like the Whirlpool Galaxy, various nebulae (the Ring Nebula was awesome. It was my first time seeing it), and a bunch of different clusters. 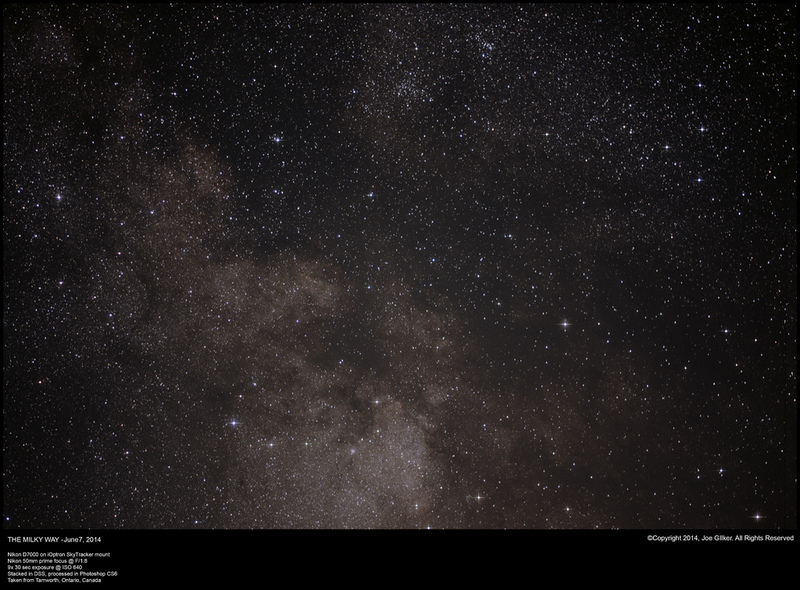 It was quite a treat to finally get to use my 8″ LX90 under a pristine sky and excellent seeing conditions. 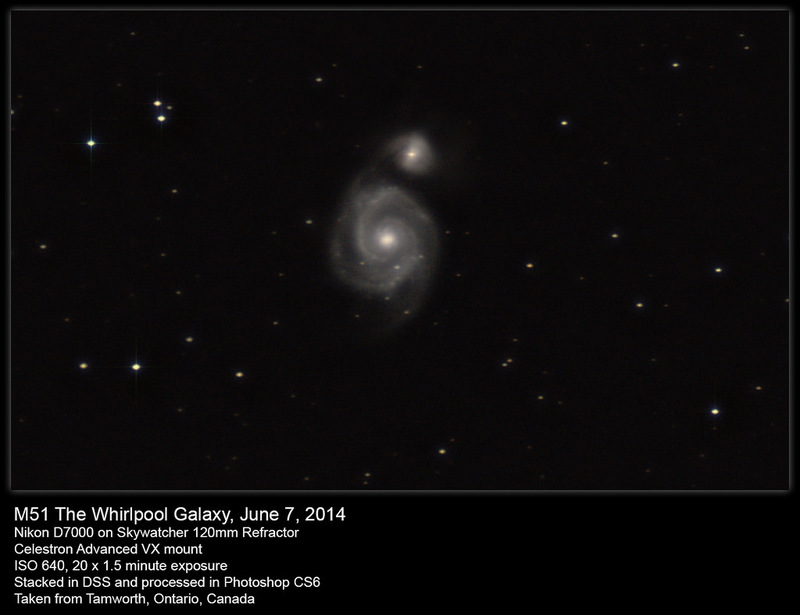 As the moon was setting, I tried my newest scope – an modestly priced Skywatcher 120mm f/5 refractor on a Celestron Advanced VX mount – to take some shots of the Whirlpool Galaxy. I attached my Nikon D7000 and went to work. I wasn’t expecting much from a non-apochomatic refractor of this size, but still managed to get some pleasing images of M51. I took a a total of 20 90-second light frames along with some dark and bias frames. I didn’t expect much, but the result turned out better than I expected. I’m really looking forward to imaging it with my LX90 on a future visit to the site on a moonless night. Once the sun had set, it was time to have some fun with the camera and my friend’s nice 50mm f/1.8 lens. We mounted it on my D7000 and put it on my iOptron SkyTracker. I found a nice random spot in the Milky way, and fired off a some test shots. Once I had settings that I was happy with, I tried a 15 second test exposure. The result was pretty pretty much perfect. I had found the sweet spot. It’s only later when I was processing the image that I discovered that a meteor had streaked across the sky as I was taking the shot. And it was perfectly centered in my field of view, as can be seen in the photo below. There was no cropping here. This is as it came out of the camera, with only some stretching of the histogram, some star diffraction and framing applied. This was nothing but sheer luck, but it was absolutely perfect. It was getting rather late at that point, but wanted to get a really rich image of the milky way. So I randomly chose a new spot that looked good, set my timer and grabbed 9 30-second exposures, 5 dark frames, and some bias frames for stacking. The light frames looked good, but it’s not until I stacked and processed the image the next day that I truly saw how awesome the shot came out.The number of stars visible in this image is really quite mind-blowing, particularly when considering this is just a small patch of the sky. So all in all, it was a great test run at a new site with some new equipment. I now have a 35mm f/1.8 lens on the way and I really can’t wait to take more deep sky images with it at this site. This summer is likely to be quite fruitful when it comes to imaging. And with that, I hope to be able to be able to update my blog more often with each subsequent imaging session.